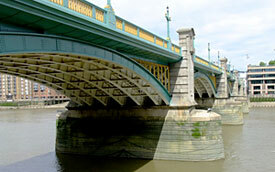 The present Southwark Bridge is the second bridge on this site — its cast iron and masonry 1819 predecessor was designed by John Rennie senior. It links Southwark and the City of London across the Thames, and is owned by Bridge House Estates, a charitable trust under the auspices of the Corporation of London. The 1921 Southwark Bridge has five spans Its four piers are aligned with those of Blackfriars’ and London Bridges for the benefit of river traffic and to mitigate the effects of tidal scour and cross currents. The spans have been constructed using steel plate girder ribs, the piers are in stone topped with decorative pierced lunettes. The bridge is 245m long and 17m wide. The design is by architect Sir Ernest George and engineer Basil Mott of Mott, Hay & Anderson. Work began in 1913 but was suspended during World War I (1914-18). The bridge was opened on 6th June 1921 by King George V and Queen Mary. On the south back, the structure is built into a flight of old stone steps once used for mooring by Thames boatmen awaiting customers. In 1956, the original lamp standards on the bridge's parapets were removed as their lanterns dazzled passing vessels. 2009 sees Southwark Bridge undergoing restoration and repainting in its original livery of bright green and yellow. The work includes the use of 1,000 tonnes of abrasive to blast the spans back to their metal framework, and 13,000 litres of paint.